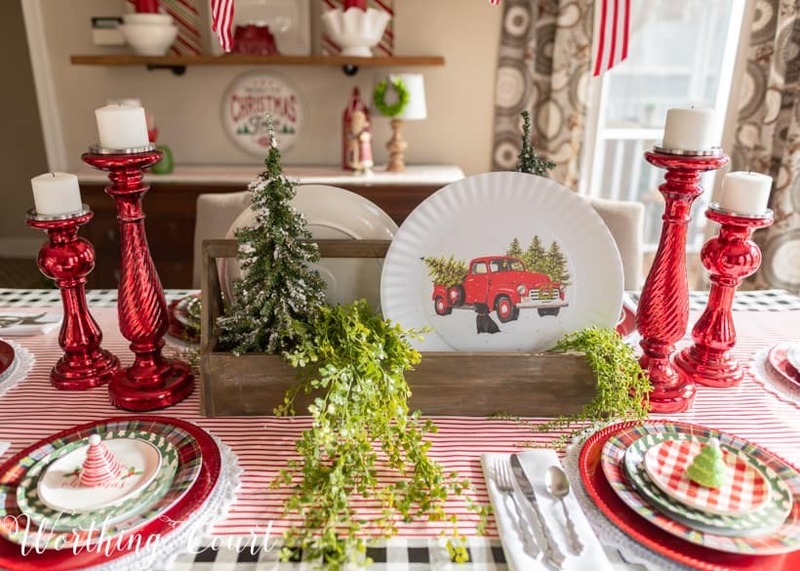 Pull out all of your festive red, white and green decor, plates and linens to create a fun tablescape for Christmas morning breakfast or brunch. 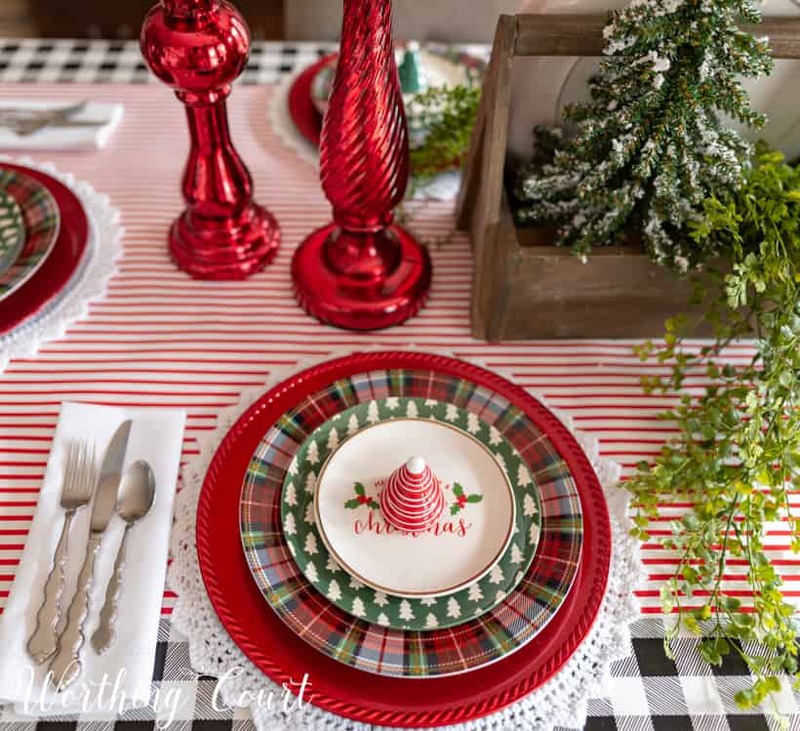 You won’t believe what I used for a tablecloth! 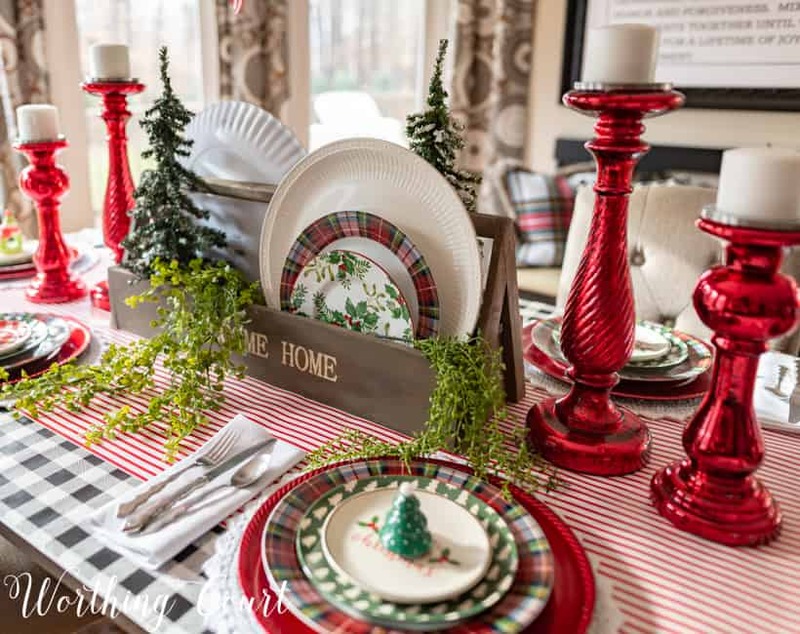 Just in time for Christmas morning, I’m sharing a fun and festive tablescape for a cheery breakfast or brunch. 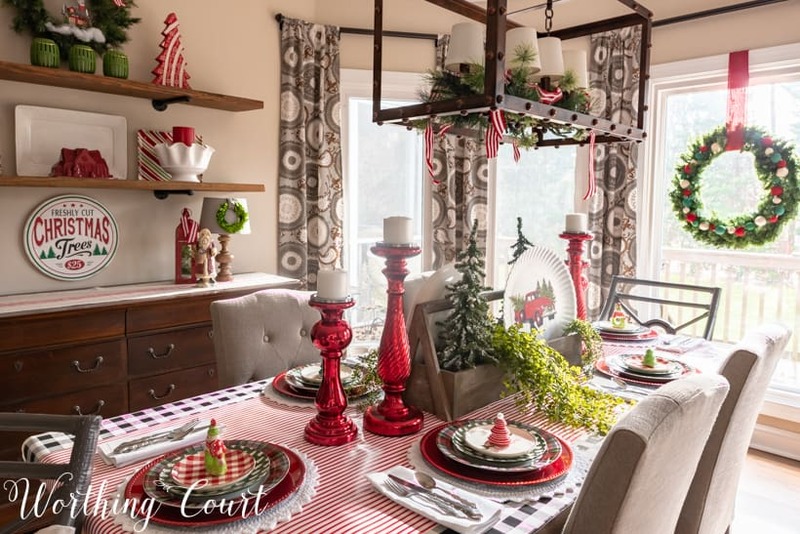 Set the table a day or two ahead of time so that all you have to do on Christmas morning is pop my make-ahead Christmas Breakfast Casserole into the oven while celebrating with your friends and family! The casserole recipe is down below. 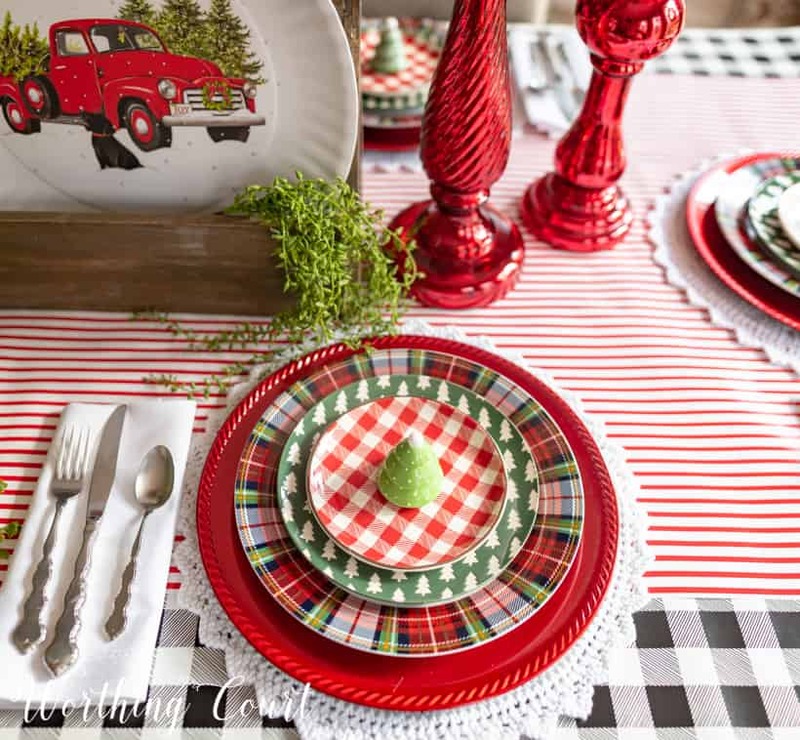 My mom crocheted a set of beautiful snowflake placemats for me, which I treasure, and I topped each one with a shiny red charger, a tartan plaid dinner plate, a super cute Christmas tree plate and a small little muffin plate. I love, love, love to mix and match patterns, so stacking all of these dishes together is so much fun for me! I tried mixing different patterned napkins with each place setting, but decided that just a solid white linen napkin would be the best because of all of the patterns already on the table. Let’s talk about my “tablecloth”. 😀 You can probably tell that it isn’t a traditional one. 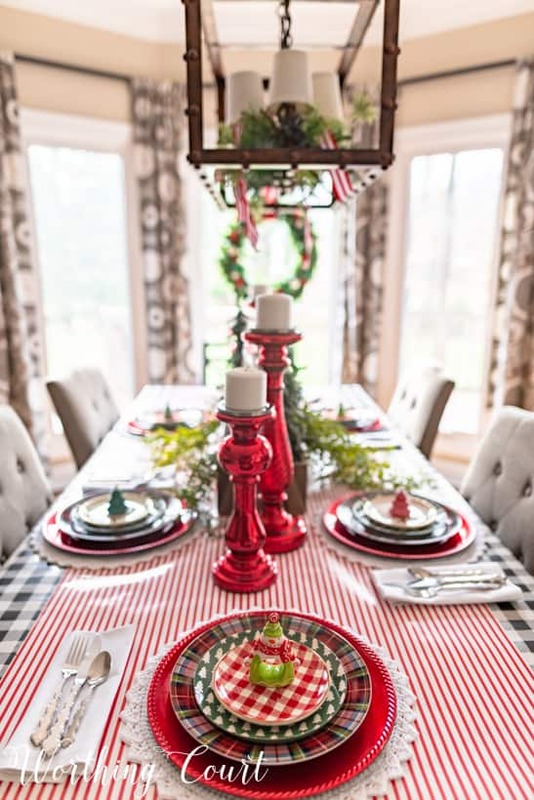 I used an extra wide roll of black and white buffalo plaid wrapping paper and topped it with more wrapping paper in a red and white striped pattern. Each end of the paper is wrapped under the edge of the table and secured with tape. All I have to do to clean up any spills or crumbs is simply wad the whole thing up! Of course, if there aren’t any spills, I’ll brush away the crumbs and roll the paper back up to use for wrapping gifts. The centerpiece would be SO simple to recreate! 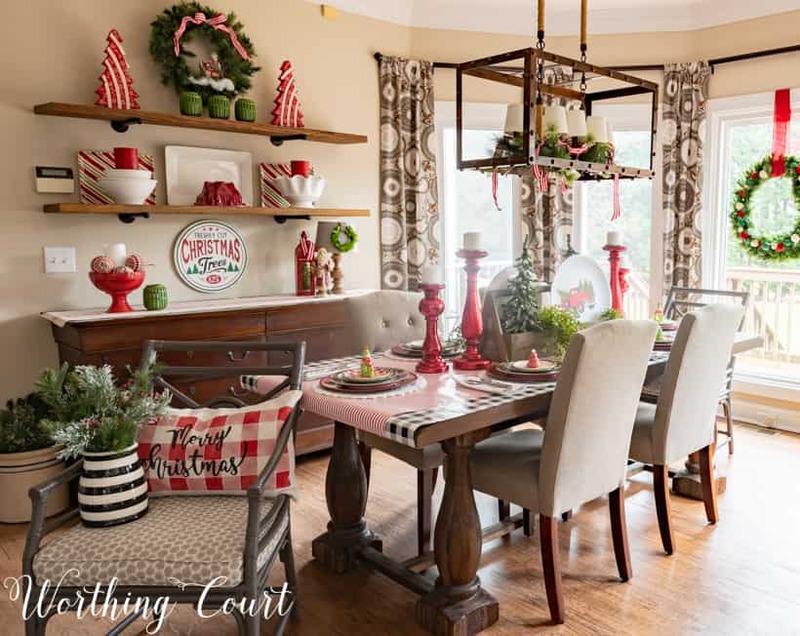 Grab any container you have around your home and fill it with Christmas platters or plates standing on their sides. Stack them in front of one another for interest and fill in empty spots with mini Christmas trees and bushy artificial greenery. I didn’t add the candlesticks at first, but when I did, it brought the whole centerpiece to life and added a little fun sparkle to the table! 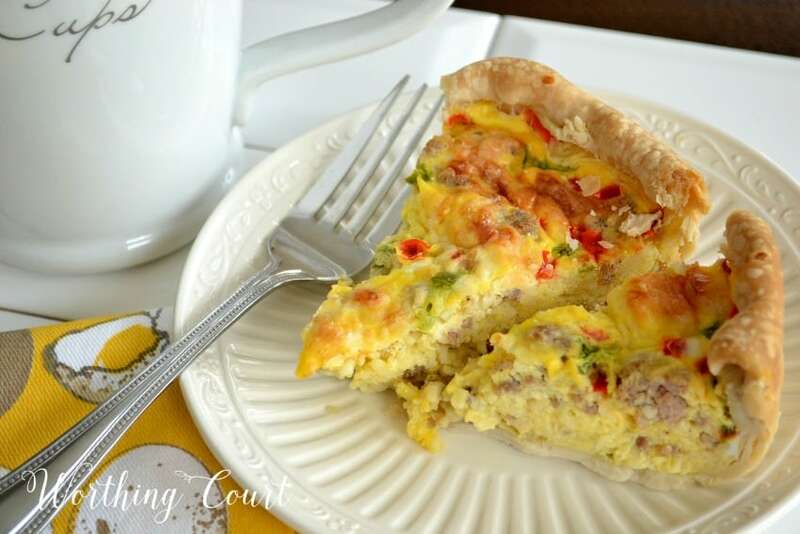 I make this breakfast casserole recipe every single year for Christmas morning. To avoid being stuck in the kitchen on Christmas morning, I either make it ahead and freeze it or, I make it the day before and heat it in the microwave on Christmas morning. We love it served with fresh fruit and orange juice! Click HERE to get the recipe. I’ll be signing off until after the first of the year to celebrate Christmas with my family, but before I go, I want to wish each and every one of you and Very Merry Christmas. May God’s richest blessings fill your home as we celebrate the birth of our Lord and Savior! 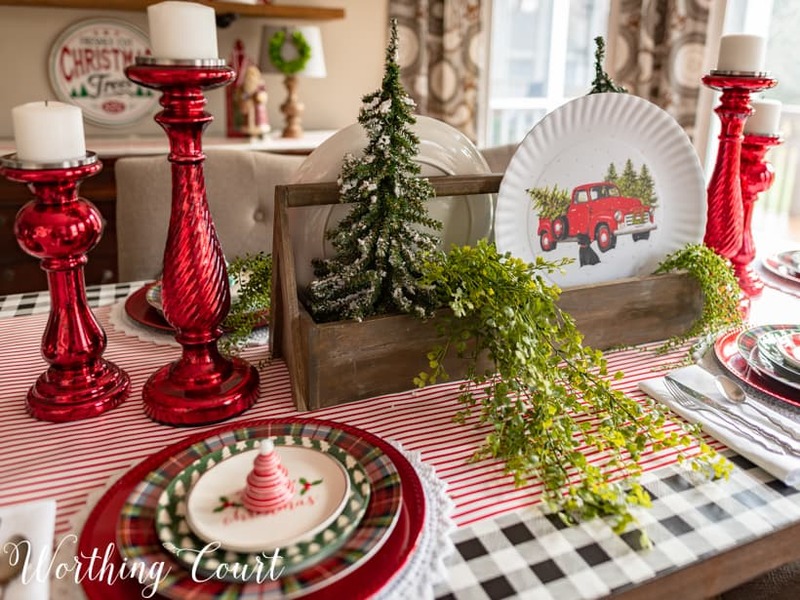 The table looks festive and inviting! Thank you for sharing so many wonderful ideas this Christmas Season. Wising you and yours a very Merry Christmas and a Happy & Healthy New Year! Enjoy the time with your family, that is the most important thing! Thank you so much, Leslie! I hope you have a Merry Christmas too! Suzy, thank you for enriching my life this year! 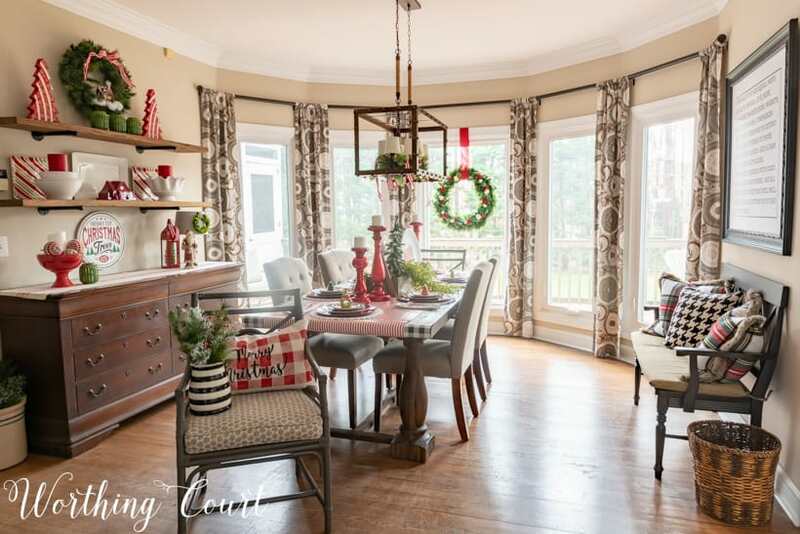 Your homey, cozy house has helped me create a place of peace and refuge for my family! Each of your pictures is a joy to behold!!! Merry Christmas to you and your family, and may the dear Lord bless you in ways you can’t think or imagine! Hugs across the miles! Thank you so much for your sweet words and sentiment, Julie. Merry Christmas and blessings to you and your family as well! That room is just too cute. Love the idea of using wrapping paper – what an easy clean up and no ironing afterward. Blessings to you and all of your loved ones. I’m hoping no one spills anything on it so I can reuse it! Merry Christmas! I love your Christmas morning table. Everything is so bright and festive. I love the plates with the red truck and the pup. May I ask where you found them? Thanks for sharing your charming style ideas. Merry Christmas and Happy New Year. I found the large platter at a local home decor store two years ago. I’ve never seen another one like it anywhere that I could link to. 🙁 Merry Christmas and Happy New Year to you as well! Have a wonderful Christmas with your family Suzy. I have enjoyed your blog this year and look forward to even more inspiration next year. Thank you, Donna! I hope you have a Merry Christmas too! Merry Christmas, enjoy your family time! Looking forward to your 2019 Blog! Merry Christmas to you as well, Martha! Cute, cute cute!! Merry Christmas Girlfriend!! Thank you, GF! Merry Christmas to you, Wickie and Emmi! Your home is gorgeous!!! I’m trying to help my mom find a light for over her table. I love yours with the lamp shades in your dining room. Would you mind posting where it’s frpm? Thank you! !